Tre Kronor has been on a roll in international competition as of late. At the 2018 World Junior Championships in Buffalo, Sweden came ever so close to winning a gold medal versus Canada. Though it was a tough loss to swallow, they should be very proud of the silver they ended up taking home in early January. A mere eight days later, the Swedish U18 women’s team brought home the silver from Moscow, Russia. At the IIHF’s 2018 Women’s U18 Worlds, the Swedes put forth one of their best female teams yet in U18 international competition, if not their best. 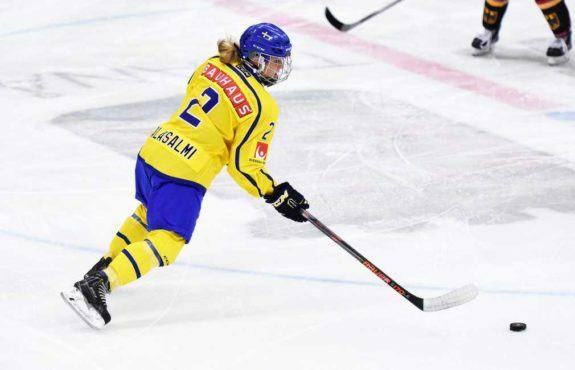 Sabina Küller will be a solid two-way player for Team Sweden in PyeongChang (Photo Credit: Mats Bekkevold). Now, it is time for the 2018 PyeongChang Winter Olympics. Will the third time around bring about Sweden’s elusive gold? They will have two cracks at it when both their men’s and women’s teams take to the ice in South Korea. Sara Grahn (Brynäs IF), Minatsu Murase (AIK), Sarah Berglind (MODO Hockey). These will be Sara Grahn’s third Winter Olympics. The 29-year-old goalie is likely to be the starter in PyeongChang given both her experience and ability. Make no mistake though – all three goaltenders are phenomenal in net. Grahn is just slightly more seasoned. At 5-foot-7 and over 150 pounds, she has good size in net. Now in her eighth season with Brynäs IF, she has played in 24 games for the 2017-18 season. That includes 3.02 goals against average to go with a .909 save percentage. Although decent in and of themselves, those are substandard numbers for Grahn. Still, she is always capable of coming up big. AIK’s Minatsu Murase is of similar size to Grahn but is seven years her junior. These will be Murase’s first Winter Games, although she has been a part of two prior Women’s Worlds in which she did not see any action. Her greatest international experience came in the 2013 Women’s U18 World Championships when she played in four games for Sweden. There, she posted excellent numbers of a 1.90 GAA and a .946 SV%. Murase has played in 26 games for AIK this 2017-18 season. She has 2.55 GAA and a .926 SV% through those games. Sarah Berglind is the youngest of the three goalies but presently has the best numbers. At 21 years of age, she has been awesome in 11 games this year for MODO. This young lady has compiled a 1.54 GAA and a .941 SV%. Berglind is also a tad smaller than Murase and Grahn. She stands 5-foot-4 and 137 pounds. But Berglind is also lightning quick. These will be her first Olympics as well. Likewise, Berglind has been part of two prior Women’s Worlds in 2016 and 2017 but has not yet seen the ice. Grahn will be the cornerstone. 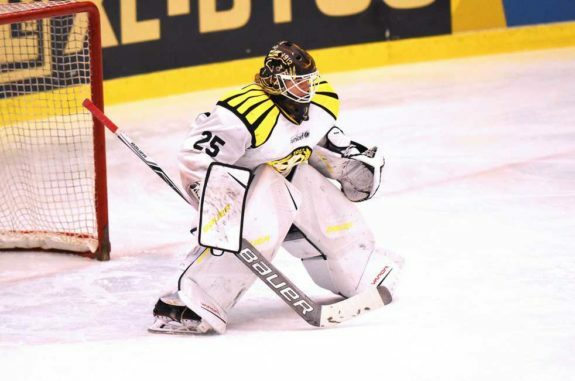 She is one of the best goaltenders in the world, and Sweden will need her to be at the top of her game. Elin Lundberg (Leksands IF), Emilia Ramboldt (Linköping HC), Maja Nylén Persson (Leksands IF), Emmy Alasalmi (AIK), Johanna Fällman (Luleå HF), Johanna Olofsson (MODO Hockey), Annie Svedin (MODO Hockey). Emmy Alasalmi is a right-handed shot from the point and is a superb puck mover. For the prior five seasons, she has had double digits assists for AIK. Currently in 2017-18. Alasalmi has three goals and six assists in 28 games. With a January birthday, she will be 24 years old by the time the PyeongChang Games get underway. The fact that she shoots right gives Sweden some nice options at the point. It helps matters too that Alasalmi generates sound passing from her stick. One of the youngest Swedes will be Maja Nylén Persson. At just 17 years of age, she has won both a bronze and a silver at U18 Women’s World Championships. The silver came just days ago at the games in Moscow, Russia where Nylén Persson served as team captain for the U18 squad. There she picked up two assists in five games. An interesting turn of events as the teenager goes from U18s to a Winter Olympics just a month later. Look for her to bring some youthful enthusiasm to this team. Johanna Olofsson will be playing in her second Winter Olympics. Last time around in Sochi 2014 she had a goal in six games. Olofsson has played for MODO for more than a decade. This year, the 26-year-old has two goals and three assists in 25 games. During the 2011-12 season, she helped lead MODO to a Sweden Women’s Elite League championship. Olivia Carlsson (MODO Hockey), Emma Nordin (Luleå HF), Hanna Olsson (Djurgårdens IF), Erika Grahm (MODO Hockey), Rebecca Stenberg (Luleå HF), Erica Udén Johansson (Brynäs IF), Fanny Rask (HV71), Maria Lindh (Djurgårdens IF), Anna Borgqvist (Brynäs IF), Pernilla Winberg (Linköping HC), Lisa Johansson (AIK), Sabina Küller (AIK), Sara Hjalmarsson (AIK). Pernilla Winberg is a hockey legend and Olympic legend in her own right. It is a shame that many fans outside of Europe go unaware of her talents. These will be Winberg’s fourth Winter Olympics. When she was 16 years old, she scored the game-winning goal in a shootout against the United States to win the silver medal for Sweden at the 2006 Torino Games. Now Winberg is 28, and will be 29 at the end of February. She has been a mainstay for her country’s team in all sorts of international competition. In 16 games at her four Winter Olympics, she has averaged a point a game with nine goals and seven assists. Sweden gets some nice size up front from Sabina Küller. The 23-year-old center for AIK stands at 5-foot-9 and is over 170 pounds. She and AIK won the Sweden Women’s Elite League championship during the 2012-13 season. Here in 2017-18, she has four goals and 13 assists in 25 games. Küller also is serving as AIK’s team captain this year. An immensely hard-working forward, Küller can be a game changer in PyeongChang. 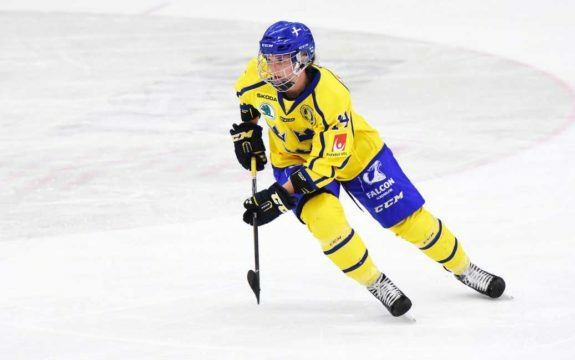 Left-winger Fanny Rask is a sniper and will provide firepower for Sweden. In five of the past six seasons in Sweden, she has hit double digits in goals. Last year for HV71, Rask had a whopping 20 goals in 36 games. Adding 19 assists to that, she was better than a point a game player. Sweden needs her to snipe a few if they are to medal. Many feel that the PyeongChang Games will be Winberg’s swan song in terms of Olympic appearances. Let us hope not. It would be quite special if she could make a drive for five. But first things first, Winberg will need to be a steadying hand on this roster if the Swedes are to medal. There are a lot of new, young faces who have never played in an Olympics before. Winberg is the elder stateswoman and she will need to guide the team through this. Rest assured – she knows how. Teenagers like Nylén Persson and Hanna Olsson can certainly hold their own, but will be in need of Winberg’s leadership. Vi kan med glädje meddela att OS-Truppen är uttagen! Fem AIK-spelare representerar Sverige i Sydkorea 2018. It would be remiss if we did not also mention that winger Lisa Johansson is also an explosive sniper. She has had seasons of at least 20 goals for four straight years now, including 2017-18. Johansson and Rask give Sweden firepower that will keep them in games against the two powerhouses of USA and Canada. They will need to be scoring at will, or at least as close to that as possible. While it is unlikely that Sweden will take a gold or silver, anything can happen. Pernilla Winberg is living proof of that. Still, it is more likely that the Swedes will shoot for a bronze. Should they come away with one, then these Olympics will be considered a success for Tre Kronor.